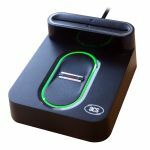 ACS Smard card reader with fingerprint sensor brings to the market effortless user convenience. Combining the core of ACS' ACR122U Near Field Communication (NFC) Reader and Authentec's swipe fingerprint sensor, the AET62 NFC Reader with Fingerprint Sensor makes integration of secure biometric authentication simple and exchange of information intuitive. 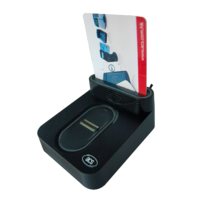 With its ergonomic design, it makes fingerprint and contactless card authentication hassle-free. Three-Factor-Authentication: Requiring of a user something he has (smart card), something he knows (PIN/password) and something he is (fingerprint), before enabling any transactionMatch-On-Device: Limiting fingerprint template extraction and matching to itself, preventing security attacks associated with PCsSimple Fingerprint System : Doing away with databases, servers or network connectivity. Instead, fingerprint templates are stored and encrypted in the smart card.Complete local-site authentication; Limiting required components for operation into three only (local PC/remote server applications, contactless smart cards, and the AET62). Thus, even developers without an in-depth knowledge of biometrics can integrate fingerprint authentication into smart card-based applications.Security Enhancement : Provision of an optional secure access module (SAM) and support for third-party algorithms. The AET62 NFC Reader with Fingerprint Sensor Software Development Kit enables users to efficiently develop new applications and systems, as well as incorporate the AET62 NFC Contactless Smart Card Reader and Swipe Fingerprint functionalities into existing applications. 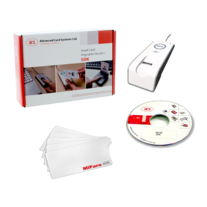 Included in the package are sample cards, sample codes, tools and utilities, demo applications, and reference materials that help developers, who may not have an in-depth knowledge of biometrics, integrate fingerprint authentication into smart card-based applications very easily. EasyKey, allows to change Mifare security settings. 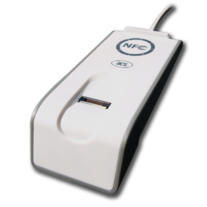 NFC Reader Tool, enables the user to perform reader and card-related commands. 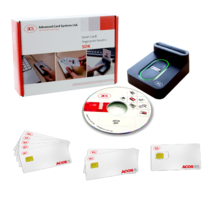 The AET65 Smart Card Reader with Fingerprint Sensor Software Development Kit enables users to efficiently develop new applications and systems, as well as incorporate the AET65 Smart Card Reader and Fingerprint functionalities into existing applications. Included in the package are sample cards, sample codes, tools and utilities, demo applications, and reference materials that help developers, who may not have an in-depth knowledge of biometrics, integrate fingerprint authentication into smart card-based applications very easily.